17-11-2018 – Fascism has arrived in Brazil. Or so we are told. Jair Bolsonaro, who won the Presidential candidacy of the Social Liberal Party (PSL) after only joining that party at the beginning of the year, won the second round of Presidential elections on the 29th of October. The ultra-right Bolsonaro secured 55.1% of the vote, over the Workers Party (PT) candidate Fernando Haddad. Bolsonaro has made a string of ultra-conservative and fascist-like statements, from openly supporting military dictatorship, the use of torture by the authorities, to overtly sexist, racist and homophobic comments. Bolsonaro even once stated that former Chilean military dictator Augusto Pinochet “should have killed more people”. Working people should be clear. Fascism has not “arrived” with the election of Bolsonaro. An ultra-right wing, ultra-conservative has won electoral power, which has created conditions which may lead to fascism – the mobilisation of dissatisfied and despairing workers and small business people combined with the forces of capitalist state power enabling the physical crushing and dispersal of Unions, socialist parties and anyone suspected of being left-wing. Ironically, labelling Bolsonaro “fascist” may even spur his popularity even further, and backfire still further on politically progressive forces. The sad truth is that the ultra-right “Trump of the Tropics” was handed power by the “left” – principally the PT, but also by other left parties trailing in its wake. Thirteen years of betrayals by the PT in government,, from 2003 to 2016, first under President Luis Inacio Da Silva (known as “Lula”), and then under President Dilma Rousseff, where the PT moved so far to the right so as to be almost indistinguishable from actual conservatives – led directly to the working class switching their allegiances even further to the right. It mirrored the combination of political circumstances that led to the US working class ultimately opting for Trumpism, convinced that something, anything, that appears to be outside standard establishment politics – is worth a try. The working class as a whole, which by no means endorses or agrees with all ultra-conservative political positions, was willing to turn a blind eye to the excesses of Bolsonaro, convinced that nothing could be worse than the PT governed status quo. In the same way that Obama and Clinton paved the way for Trump, Lula and Dilma paved the way for Bolsonaro. Also, in both cases, the capitalist left (the Democrats in the US, the PT in Brazil) was aided and assisted by the extra-parliamentary left parties, who ultimately could not break from “lesser evilism”, and thus remained as activist adjuncts to the “left” in government. No matter how right wing the Democrats and the PT became, these left parties in practice played the role of establishing an effective permanent popular front. A popular front is usually where ostensibly pro-working class organisations and parties link themselves to a “progressive” capitalist party, in a “broad front” against the right. But what this automatically entails is the working class chaining itself directly to the “left” wing of the ruling class, completely disempowering it. The popular front can raise no demands whatsoever that are not acceptable to the capitalist class as a whole – and thus the working class as a whole understandably sees it – and mistakenly the “left” – as no different to the entire system which makes their lives harder to endure. It’s true that the PT in government carried out some minor reforms. The Progama Bolsa Familia (PBF) was introduced by Lula in 2003, and gave cash transfers to poorer families in return for ensuring children attended schools and were vaccinated. It led to a reported 28% reduction in poverty overall. Between 2003 and 2010, the years of the Lula presidency, the Brazilian minimum wage steadily increased, and in fact quadrupled. There was also the creation of 14 million formal sector jobs, which led to an impressive Gross Domestic Product (GDP) growth rate of 7.5% by the time Lula left office, when he handed over to Dilma Rousseff. These redistributive practices, and the resulting surge in apparent economic growth, led to Brazil joining the US Empire challenging BRICS (Brazil, Russia, India, China, South Africa) economic and political bloc. However, these measures did little to counter the overall fiscally conservative economic policies of the PT government. There may have been a hope, when the PT was first elected in 2003, that it might be immune to the widespread corruption of the Brazilian capitalist political system, which pre-dated the election of the PT by decades. But it wasn’t long before the PT, and Lula himself, was implicated in overtly corrupt practices. In 2006, the PT was investigated by federal police for spending 1.7 million reais (the Brazilian currency) on a “proof of corruption” file against a political rival to the PT running for governor of Sao Paulo. Lula denied any involvement on his part, but the then PT president was forced to resign. It was the PT in power when extensive protests over increases in public transport fares broke out in 2013. It was the PT in power when deforestation in the Brazilian Amazon – the “lungs of the earth” – virtually reached the “point of no return”. It was during the time of the PT in power when Brazil’s prisoners revolted over the relentless overcrowding of prisons. It was the PT government that did little to address concentrated land ownership in Brazil, and even favoured corporate agribusiness against landless peasant farmers, a reported 200 000 of whom still have no plot of land to till. In fact, it was the Dilma led PT government which classified roadblocks and land occupations – protest measures used by landless peasant farmers – as “terrorist” crimes. It was the Lula led PT government which sent Brazilian troops to occupy Haiti in 2004, and where they remained for 13 years. Reportedly the Brazilian troops as part of the United Nations Mission for the Stabilisation of Haiti (Minustah), took part in the terrorisation of the poor and students in the favelas of Haiti, in which some Haitians perished. These practices were repeated against poor Brazilians who rose in revolt against the millions spent by the PT led governments hosting the 2014 World Cup and the 2016 Olympics. Very early in the Lula PT government, from around 2004, the PT’s open attacks on the pension system aroused bitter indignation from Brazil’s workers. The age of eligibility for the age pension was jacked up to 60 for men and 55 for women. Today this may sound modest, but in fact the eligibility age for the pension at the time exceeded average life expectancy, which then stood at 59. There was a wave of workers’ strikes in response. In short, the PT led a capitalist government in Brazil from 2003 to 2016, whose actions engendered bitter hostility and enmity from Brazil’s vast working class. Much is made of Bolsonaro’s seemingly open embrace of racism, sexism and homophobia. Make no mistake, the working class movement for socialism cannot be successful unless it combats racism, sexism and homophobia in the process of its struggles against capitalism. The problem, however, is that today, the liberal left harps on about these issues in isolation from a political offensive against the ravages of the free market system. The liberal left also excuse the capitalist left – the PT in the case of Brazil – from their targeting. They assume that the words of capitalist parties such as the PT means that the PT actually genuinely opposes racism, sexism and homophobia. While the rhetoric of the PT may rail against these things, the PT does not attempt to confront the system of private production for private profit – which produces the racism, sexism and homophobia in the first place. In the 1960s and 1970s, at least in the West, there was a working class upsurge against the imperialist war on Vietnam waged by the US government. This led to the famed ‘radicalisation’ of politics at that time, with many working class people identifying with socialism. This partially enabled other sectors to politically radicalise, as they were given momentum by the vast anti-war movement – but also by an extensive trade union and workers’ movement. This was the time of the “second wave” of feminism, which made strides towards women’s liberation. It was the time of expansive anti-racist movements, with the civil rights movement involving African-Americans in the US. And it was the time of the initial breaking through of movements for lesbian and gay liberation. These were vital political steps forward, and they had great political impact because they were linked to large scale progressive working class movements such as the anti-Vietnam war movement and a strong trade union movement. Fast forward to today, and we unfortunately find that the Union movement is probably at its weakest point in a century. And unfortunately there is scarcely an anti-war movement at the very time when the world is threatened by a new cold war. In fact, much of the Western left actually came behind the imperialist wars on Libya and Syria. So when workers see the liberal left engaging in loud campaigns against racism, sexism and homophobia – but are almost silent during imperialist wars AND during years of ruling class attacks on living standards – understandably some workers come to view the left as being of very little help. In fact, some workers can come to see the “left” as part of the problem. In addition, workers do not take kindly to being lectured on racism, sexism and homophobia – especially from a left which has offered them no assistance in dealing with things such as the skyrocketing cost of living. Workers especially resent being lectured if it is implied that they themselves are racist, sexist and homophobic. With a “left” continually moralising about these issues, and also being tied to the capitalist left – it is understandable that some workers will reject the “left” altogether, and look to the right, even the fascist far right. Workers are not inherently racist, sexist or homophobic, and they can be won to fight against such scourges, but only when connected to a struggle for their own (class) interests. If indeed Bolsonaro does start a fascist movement in Brazil and in Latin America, one thing is certain – the liberalism that produced Bolsonaro will never be able to defeat him. Liberalism is not counterposed to fascism, and has little interest in fighting it. One could argue that fascism is the end product of liberalism. Liberals see people as individual voters for a strong state, whereas fascism simply dispenses with formalities and unites everyone – against the left – to form a strong state. Under a fascist state some liberal politicians may miss out on jobs *as politicians*, but that is about it. In reality, their connections with big business means that they will scarcely miss out altogether. 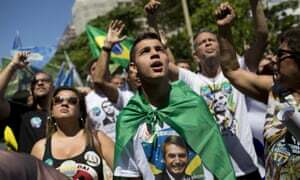 Potential fascism in Brazil can thus only be fought if the working class makes a complete political break with the capitalist left – the PT – and also the liberal left which united into an electoral popular front with the PT, which includes PSOL (Party of Socialism and Freedom) and the PCB (Brazilian Communist Party). This is the only way to start reaching the workers and young people who turned to Bolsonaro after seeing and experiencing the betrayals of the PT in government. A genuine Marxist party, speaking to workers’ direct needs, will be required to lead both Brazil and Latin America away from an abyss.